Cockatiels (Nymphicus hollandicus) are wee Australian parrots that make loving pets in homes all around the globe. As far as coloring goes, you just never know what to expect with the species. Avian breeders, through selective breeding, have introduced many new color morphs in cockatiels, including an albino variety. Albino cockatiels are produced by breeding two other cockatiel morphs together -- specifically whiteface cockatiels and lutino cockatiels. Lutino cockatiels often have entirely white or yellowish plumage, along with intense orange markings on their cheeks. Whiteface cockatiels don't have any of those orange facial markings, however. If you blend these two color morphs, the end result is a cockatiel that is purely white -- albino style. It isn't uncommon for people to mix lutino and albino cockatiels up. Although albino cockatiels have totally white feathers, their bodies aren't 100 percent white, as they possess conspicuously bright red or deep red eyes. Since their eyes are free of pigment, they often don't adjust well in homes with particularly harsh and bright lighting conditions. Cockatiels on the whole typically have deep brown or blackish peepers. The color morphs in the cockatiel world are indeed diverse. Some cockatiels have "cinnamon" or deep brown or grayish-beige coloring. Other cockatiels have mostly cinnamon coloring, but with elements of pink on their feet and bills. These cockatiels are known as fallow cockatiels. Pearl cockatiels typically are yellow or white in color, but with noticeable gray borders to their feathers. Cockatiels often come in two colors, with clear distinctions between the foundations of their bodies and their tails, upper chests and wings, for example. Although cockatiels are undeniably diverse color-wise, their actual coloration is often a little less vivid in comparison to that of fellow parrots such as macaws and parakeets. Cockatiels out in nature are markedly less diverse than their sometimes more glamorous captive counterparts. 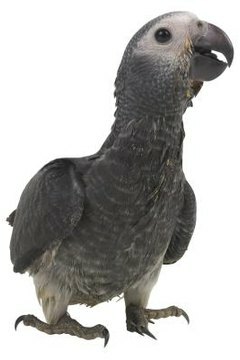 They're often known simply as "gray cockatiels." The male specimens have gray or deep brown feathers, with elements of orange and white throughout their bodies. The female specimens, like the males, are mostly gray too. They also feature somewhat lackluster orange markings on their cheeks. Gray cockatiels are also commonly seen as household pets, and are perhaps the most widespread of them all.